EVELYN has been married for forty years, since her husband slipped off her first wedding ring and put his own in its place. DELPHINE knows both sides of love: the ecstatic high of seduction, and the bitter fury of an affair turned to ashes. JAMES, down on his luck, knows his wife's family think she could have done so much better. KATE, who has lived with Dan for ten years, has seen every kind of wedding, and vowed never to have one of her own. And MARY FRANCES GERETY, a young copywriter in an up and coming advertising agency in 1947, has to convince the world of two things: that marriage means a diamond ring on every woman's finger, and that she is as capable of doing her job as any man. This whopping 400 page book is about love and engagement, but it is not about happily ever after. Told in five different voices, it is an exploration of the ways that the idea of love and marriage has evolved throughout the twentieth century. As a broad structure, we are also treated to snippets of the story of Mary Frances Gerety, the real woman behind the advertising campaign "Diamonds are Forever." While fascinating historically, the story of Mary Frances lacks real narrative purpose. Unlike the other voices, Frances' chapters jump forwards and backwards in time and consist largely of internal monologues, heavy in backstory. The character herself is spunky and likeable, and it is interesting to read about the trials of a woman in the advertising industry- but there is a lot of wasted potential there are I feel like Frances could have had a novel all her own. The other parts seem at first like they are jumbled up short stories. Until I finished the book, I saw no sense in interspersing them, but SPOILER ALERT the characters in this book aside from Frances are all linked! I won't tell you how, just to keep you guessing. The book begins (chronologically) with Evelyn and Gerald. For Evelyn, love means faithfulness and steadfastness, despite the fact that her husband has started entering every raffle and sweepstakes that he can find since he's retired. She is therefore completely baffled when her son Teddy, who has always been less than perfect, leaves his angel of a wife Julie and their two daughters for a harlot named Nicole. Evelyn wants Teddy to share the same opinion of love that she does- that when you marry, you marry forever, even if your first husband dies, and you (oh, I don't know) marry his best friend, and live the rest of your life with a ghost in bed between you. Then there is James, an EMT living and working in the 1980s, just struggling to make ends meet. He's married to Sheila, who is from a preppy, all-American background and has a perfect, preppy sister married to a suitable man who is very unlike James. James feels the pressure of Sheila's family's expectations pretty heavily but he is too proud to accept money from his father-in-law and ends up working long shifts. He also has latent anger and drinking issues. He and Sheila have two sons. Personally, I think more than Sheila's family thinking James is not good enough, it is James himself who feels guilty for dragging Sheila down. As the only male protagonist in the novel, James is more complicated, because his love for Sheila at times takes an almost violent form- when she is mugged and her wedding ring is stolen, instead of wanting to comfort her, he wants to find the culprit and harm him. These chapters take the form of one of those Disney Christmas type movies- a mad race against time to be there for Christmas morning with the perfect gift- but lack the warm fuzzy feeling, because a dark cloud hangs over this relationship. After James comes Delphine, a French music enthusiast who meets her husband Henri when they both attempt to buy the same music shop. Her husband happens to own a rare Stradivarius. They work together and are good friends, but while Henri's passion burns, Delphine is only lukewarm. When PJ comes to buy the Stradivarius violin and they begin an affair, the heat that she was missing seems to fulfil her. Delphine soon discovers that like all fires, this passion is quick to consume and die, and betrayed, she sets about destroying PJ's world like he destroyed hers. She learns that loyalty and respect, like she had with Henri, are the truest foundation for marriage. Whilst reading each segment, I felt the potential for hope. The redemptive power of love was quite clear for each character, and yet when things that happened after the stories had closed were revealed during other chapters, I realised that there truly was no happily ever after. (Spoilers...) Evelyn dies in the back of James' ambulance, James and Sheila get drunk and fat respectively and end up living off the money given to them by their son Parker, who is the PJ who cheats on Delphine. Delphine loses the ring PJ gives her in a taxi, and it is sold and then lost again by Kate. Perhaps only Kate and Delphine have happy endings, but maybe it is too soon to know. 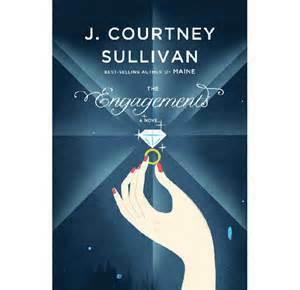 So is J. Courtney Sullivan pro love, against it, or maybe just wary? I enjoyed reading this novel on a very superficial level. The language was florid, the prose over told, but in the end, the ideas sparkled like diamonds, and it was nowhere near as fluffy as it had the potential to be. I liked the clever way that the stories revealed themselves to be linked at a steady rate rather than it being obvious all along, and I particularly enjoyed Delphine's story.